Review: The Return of the RALLY BAR! So Good Blog readers! It’s Eric, your friendly neighborhood Junk Food Guy again, coming to you this Monday afternoon. What’s there to say about today? The Kansas City Chiefs are the only unbeaten team in the NFL, The Sox are playing the Cards in the World Series, and Episode 15 of my podcast, the Nosh Show, is out today! What is the Nosh Show? It’s a podcast where a bunch of food reviewers like me talk about junk food and fast food! The dudes on the show are some of the ones linked through this blog – Grub Grade and On Second Scoop. And on today’s Nosh Show, we discussed what I reviewed for you today: The Return of the Rally Bar!! Remember the Rally Bar? I don’t 🙁 But according to Collecting Candy, it’s on old candy bar that used to be around a long time ago in the 70’s by Hersheys. Collecting Candy has a great run down of the Rally Bar through the ages, but what I love the most is how the description of what it is has changed as time went on: “crowded with peanuts, caramel, fudge and Hershey’s chocolate.” “Milk chocolate covered nut roll.” “Peanut caramel bar.” And most recently, “made with peanuts, chocolate, and caramel.” I don’t know about you, but these all seem like inconsistent descriptions. Get it together, Hershey’s. Reviews around the web, including that of my candy expert friend, Cybele, are just as confused – is this an Oh Henry bar? Is this a Snickers? A chocolate covered PayDay? Baby Ruth knockoff? Even on the Nosh Show, the dudes over at Nerd Lunch weren’t sure that this wasn’t just the same as another existing candy bar. Another question is why did it ever cease production? It doesn’t seem so offensive – nougat-y center, covered in peanuts and caramel, covered in chocolate. (Again, HOW is this NOT a Snickers?) Did it get replaced with another candy bar that was similar? Was Rally not a good enough name? One of the Nerd Lunch guys says this reminded him of a Nutrageous Bar. Yet ANOTHER potential candy bar it could be! Opening up the wrapper, this Rally Bar looked a lot like a Baby Ruth. Small, bumpy with peanuts, and chocolate covered. Looked pretty tasty, and smelled plenty chocolatey too. Bite time! Well, knockoff or not, this Rally Bar candy bar was pretty damn good – a very simple flavor combo that is guaranteed to please. 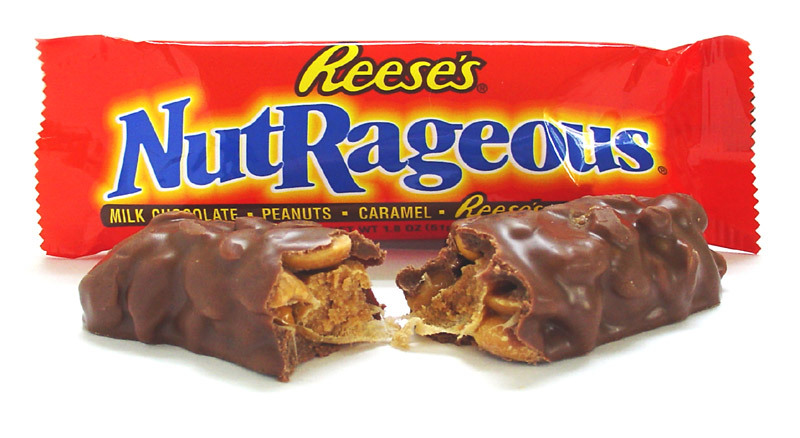 I’m not sure if I ever had a Reeses Nutrageous Bar, but this definitely reminded me of a chocolate covered PayDay or a Baby Ruth. Sweet milk chocolate-y exterior. Inside, the nougat wasn’t soft and fluffy like a Snickers or Milky Way, it was tougher and chewier, more like the center of a PayDay or Baby Ruth. In fact, I’m still pretty confused, because this is basically the EXACT SAME THING as a Baby Ruth. Except Baby Ruth is made by Nestle, and this is made by Hershey’s. AH-HA! There’s the rub. All in all, a great candy bar, though, and the extra nougat and peanuts will stave off hunger for a decent amount of time. At the price point, this may be my go-to candy bar for a while. This doesn’t taste like a Baby Ruth, even if it looks like one. It tastes like an Oh Henry! bar. Also, if you had eaten a Nutrageous, you would remember it. It is the bar that combines all the best qualities of every other mainstream candy bar. Had it been marketed properly, it could easily have permanently crippled the competition.